Acknowledgements. SCOR Working Group 106 Biographical Notes. 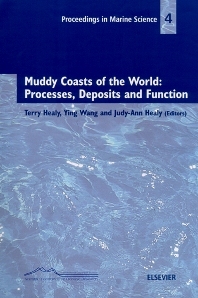 Research issues of muddy coasts (Ying Wang, T. Healy, SCOR Working Group 106). Definition, properties and classification of muddy coasts (Ying Wang, T. Healy, SCOR Working Group 106). Mudshore dynamics and controls (A.J. Mehta). Distinguishing accretion from erosion-dominated muddy coasts (R. Kirby). Relative sea level changes and some effects on muddy coasts (S. Jelgersma, T. Healy, E. Marone). Geographic distribution of muddy coasts (B.W. Flemming). Biochemical factors influencing deposition and erosion of fine grained sediment (P.G.E.F. Augustinus). Natural biological processes and control (M.D. Fortes). Mangroves as indicators of sea level change in the muddy coasts of the world (Y. Schaeffer-Novelli, G. Cintron-Molero, M.L.G. Soares). Typhoon storm surge and some effects on muddy coasts (Chenglan Bao, T. Healy). Fine sediment dynamics in the mangrove-fringed, muddy coastal zone (E. Wolanski, S. Spagnol, E. B. Lim). Human influences on muddy coasts (Mukang Han). Tidal flats and associated muddy coast of China (Ying Wang, Zhu Dakui, Wu Xiaogen). Muddy coasts of mid-latitude oceanic islands on an active plate margin - New Zealand (T. Healy). Muddy coasts of India (M. Baba, S.R. Nayak). Late Quaternary stratigraphy of the muddy tidal deposits, west coast of Korea (Yong Ahn Park, Kyung Sik Choi). Saltmarshes in the West Solent (southern England): their morphodynamics and evolution (Xiankun Ke, M. Collins). Tidal dynamics in two contrasting muddy coastal environments - Jiangsu and The Wash (Xiankun Ke). Sediment content of the ice-cover in muddy tidal areas of the turbidity zone of the St. Lawrence estuary and the problem of the sediment budget (J.-C. Dionne). Morphodynamics of muddy environments along the Atlantic coasts of North and South America (B. Kjerfve, et al.). Mud threat to the Great Barrier Reef of Australia (E. Wolanski, N. Duke). The SCOR (Scientific Committee on Ocean Research of ICSU) Working Group 106 was tasked with reviewing the geomorphic, sedimentary and oceanographic dynamics of muddy costs, assessing the impact of sea level rise on muddy coasts, especially in estuaries, and to recommend future research pathways relating to muddy coasts. This book addresses these questions and includes chapters on the research issues of muddy coasts, the definition of muddy coasts, sea level rise effects on muddy coasts, fundamental dynamic processes effecting muddy coast formation, the role of mangrove and salt marsh vegetation, bio-geochemistry of muddy coast deposits, storm surge effects on muddy coasts, human impacts on muddy coasts, and a detailed geographical review of muddy coasts of the world. The volume presents examples of muddy coasts sedimentation from many different environments of the world including the broad expanse muddy coast of China, muddy coasts of continental trailing edges (the Americas), muddy coasts in seasonally ice covered environments, muddy coasts in areas of tropical coral reefs, muddy coasts from the tropics, muddy coasts resulting from large river discharges, and muddy coasts of mid-latitude oceanic islands.